If you wait until April to get out in the woods you'll miss the first flower of spring. Unlike the flower it contains, however, this spathe is a work of art. Bulbous at the base, which you could encircle with your thumb and index finger, it extends upward in a twisting, tapering spiral three to six inches tall. 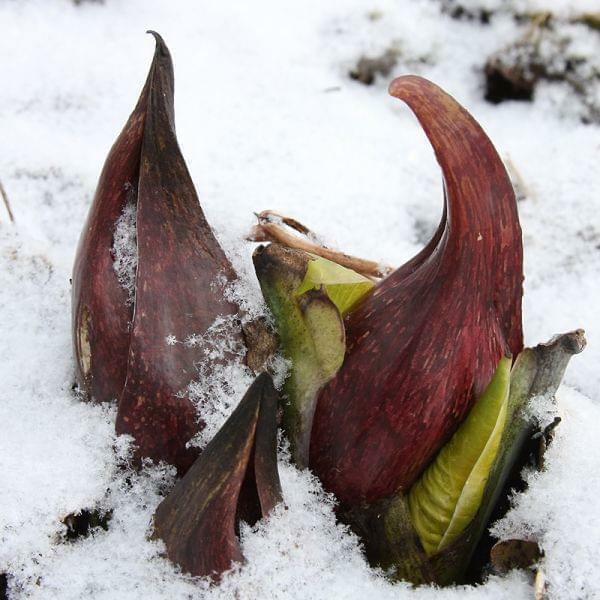 In color, this spathe may be as nondescript as the winter ground from which it grows, dull brown or gray. But it may also be quite dramatic. The most beautiful among them are wine-red, marked with lighter shades the color of brick and speckles of pink. 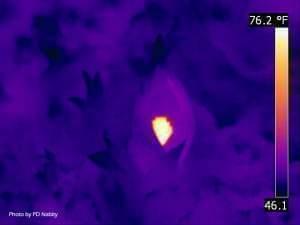 Aside from the beauty of its spathe, Symplocarpus foetidus distinguishes itself from all other plants native to Illinois by the fact that it generates heat--enough so that its flower can remain 36 degrees warmer than the surrounding air for a period of about two weeks. This capacity allows it to grow in frozen soil, and also provides an inducement for early emerging insects, by which it is pollinated, to hang around. I’ve been coy about calling Symplocarpus foetidus by its common name because that name draws attention to aspects of its personality that people may find unappealing. That’s “skunk cabbage,” and this is definitely a plant that lives down to its name. As the flower of skunk cabbage matures, it gives off a distinct, skunk-like odor, an odor that can also be produced by crushing any part of the plant. It’s unattractive to people, but a real turn-on for carrion-eating insects, and, hey, a plant needs to please its pollinators. Something cool about skunk cabbage that you can’t know by observing its aboveground components is that it grows deeper into the earth every year, pulled downward by a massive root system that alternately extends and then gradually contracts. On account of that, it is said to be impossible to dig an old one out of the ground. Skunk cabbage flourishes in woodland habitats where the soil remains mucky throughout the year, which are few locally. The most accessible places to seek it are at seeps in the Middle Fork State Fish and Wildlife Area, north of Kickapoo State Park, and in the Vermilion County Conservation District’s Forest Glen Preserve. If you are not inclined to seek out skunk cabbage in the next few weeks, you might look for it later in the season as its giant leaves—some more than two feet long—unfurl. But don’t wait too long. As summer begins to wear, they die back in their own unpleasant way, dissolving into a smelly black slime rather than drying out.